Adenoidectomy is the surgical procedure in which the adenoids are removed. Adenoids are lymphoid tissue located in the back of the nose. They are often not understood by the lay public or by physicians who are not otolaryngologists because they are not observed during routine physical examinations because of their location. 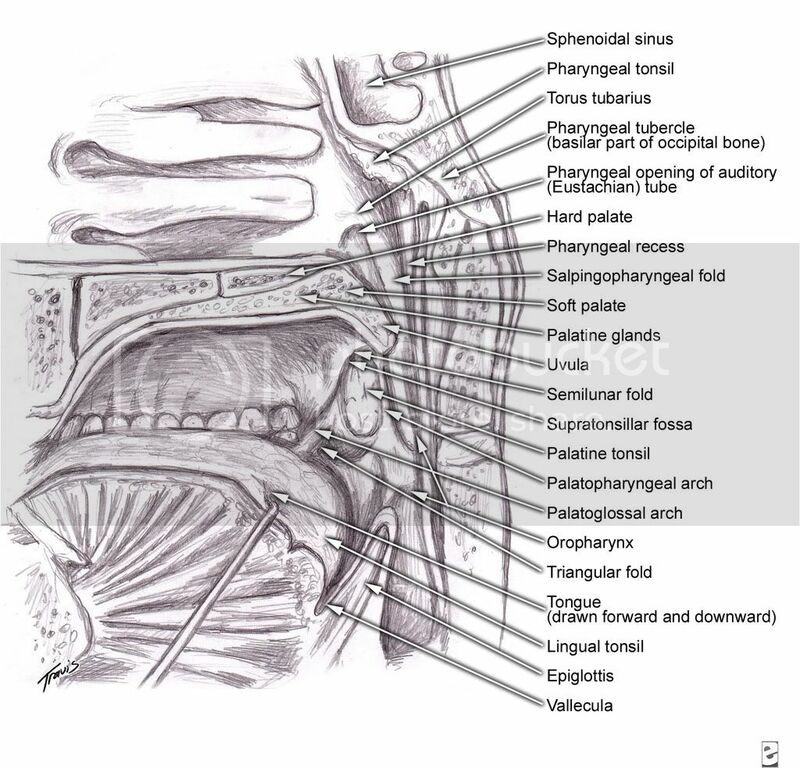 Although the tissue composition of adenoids is the same as that of the tonsils, the diseases associated with infected adenoids differ from the diseases associated with infected tonsils, based on their location. This causes additional confusion because the adenoids are often simultaneously grouped with the tonsils. An adenoidectomy is often associated with other surgical procedures (eg, tonsillectomy, placement of tympanostomy tubes). In fact, throughout most of the 20th century, tonsillectomies were usually performed in conjunction with adenoidectomies. Despite more than 50 years of research, some controversy is still associated with the indications for adenoidectomy. Most often, an adenoidectomy is performed in pediatric patients. The focus of this article is pediatric adenoidectomy. Adenoidectomy was probably first performed in the late 1800s when Willhelm Meyer of Copenhagen, Denmark, proposed that adenoid vegetations were responsible for nasal symptoms and impaired hearing. However, tonsillectomy has been performed for at least 2000 years; Celsus first described the procedure as early as 50 CE. The hidden location of the adenoid certainly had an impact on the historical timing of discovery. The 2 operations were routinely performed together beginning in the early part of the 1900s, when the tonsils and adenoids were considered reservoirs of infection that caused many different types of diseases. Tonsillectomy and adenoidectomy (T&A) was considered a treatment for anorexia, mental retardation, and enuresis or was performed simply to promote good health. As odd as those indications sound, they actually can be explained. Children with failure to thrive have improved appetites and gain weight after tonsillectomy and adenoidectomy (T&A) because their throats are typically no longer chronically sore and they can breathe better. Children who have persistent middle ear effusions often have hearing loss and associated speech delay and may be classified as mentally challenged. Adenoidectomies help resolve ear fluid problems, speech delays, and perceptions of low intelligence. Enuresis has actually been studied and listed as an indication for tonsillectomy and adenoidectomy (T&A) because large tonsils and adenoids block normal breathing through the nose and mouth, which interrupts sleep architecture and decreases normal brain and brainstem control of urinary function. Additionally, almost every child experiences improved health and more energy following tonsillectomy and adenoidectomy (T&A). Based on the broad range of indications for surgery, tonsillectomy and adenoidectomy (T&A) became almost universal for school-aged children in the early 1900s. In the 1930s and 1940s, the widespread use of tonsillectomy and adenoidectomy (T&A) became controversial because (1) antimicrobial agents were developed to help treat tonsillitis and adenoiditis, (2) the fact that a natural decline in the incidence of upper respiratory infections in older school-aged children became evident, (3) some studies were published showing that tonsillectomy and adenoidectomy (T&A) was ineffective, and (4) an increased risk of developing poliomyelitis following tonsillectomy and adenoidectomy (prior to the vaccine) was recognized. Once the opinion pendulum began to swing towards avoidance of surgery, good prospective clinical trials, which have been performed over the last 2 decades, were required to prove to the medical and lay community that good indications for tonsillectomy and adenoidectomy (T&A), tonsillectomy alone, and adenoidectomy alone, exist. Because adenoids trap germs that enter a child's body, adenoid tissue sometimes temporarily swells as it tries to fight off an infection. There are several symptoms associated with enlarged adenoids. •Ask about and then check your child's ears, nose, and throat. •Listen to your child's breathing through a stethoscope. •Feel your child's neck near the jaw. To get a really close look, the doctor may even want to take one or more X-rays. For a suspected infection, the doctor may prescribe oral antibiotics or maybe an injection of penicillin. Having your child's adenoids removed is especially important when repeated infections lead to sinus and ear infections. Badly swollen adenoids can interfere with ear pressure and fluid movement, which can sometimes lead to hearing loss. Therefore, kids whose infected adenoids cause frequent earaches and fluid buildup may need to get an adenoidectomy as well as ear tube surgery. And although adenoids can be taken out without the tonsils, if your child is having tonsil problems, they may need to be removed at the same time. A tonsillectomy with an adenoidectomy is the most common operation for children. Last edited by trimurtulu; 02-25-2009 at 11:18 AM.